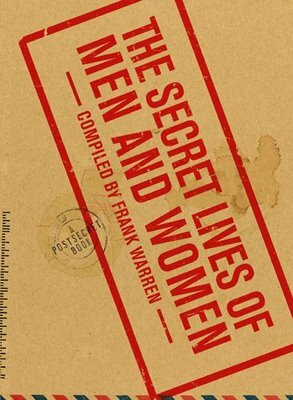 Frank Warren very kindly offered me an advance copy of his latest PostSecret book, The Secret Lives of Men and Women. This new volume, Frank's third compilation of post card secrets, makes for a very compelling read. In contrast with the second book, which focused on the secrets of young people, the artwork and stories that spill from these pages come from the hands and minds of adults. Although at times, the secrets are as childlike as any youngsters. From the first day I found PostSecret online, I was addicted. I've written and mailed postcards of my own, but I've never seen them on the site or in a book. But that doesn't really matter. The cards tell universal stories of love and hate and triumph and loss. (Okay, with the exception of that one about the civil war soldiers. I mean, wtf was that about?) Toward the end of this new book there is a card with a big pink heart at the center. In the heart is a wheelchair symbol and the words "This heart is wheelchair accessible." Around the heart are written these words: "They think I stayed out of guilt & pity, but I did it because he's still as strong, smart & funny sitting as he was standing ...it's also why I asked him to marry me." It made me cry. It was the end of the emotional wave that you feel when you read one of these books. You laugh, you catch your breath in amazement or shock, you "awww"... and you cry. Each postcard is a window into another life, and each is beautiful and sad and wonderful. Congratulations, Frank, on choosing another fine group of cards to share with us. I have this book on pre-order on Amazon. Can't wait for it to arrive! I love Frank's work. And, btw, about the Civil War postcard: WTF? is right! Did you see that Post Secret was nominated for a Bloggie?